Guest writer Gillian Moorse explains how good whistleblower policies and procedures are an essential part of ensuring good governance, backed by research and offering practical guidance. The importance of good governance in every sector of society whether it is in national or regional government, in public bodies or private corporations, in the judiciary or law enforcing agencies is vital and transparency, the exposure of malpractices, fraud and corruption is vital for many reasons. It has also been established that good governance starts at the top but should pervade every level of an organisation – and its principles should be part of the whole organisation culture embraced by everyone. 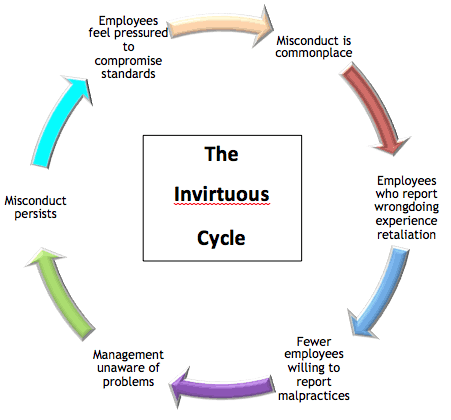 If a blind eye is turned to malpractices then this can allow an “Invirtuous Cycle” [sic] of corruption to become embedded into the organisation culture which, as the following diagram from the Ethics Research Center demonstrates, becomes a vicious circle. The consequence of this is an erosion of ethics throughout some organisations (see the case study of Enron as a classic example) and the implicit tolerance of wrong behaviour in modern society generally (as revealed in the Leveson Inquiry) – factors which may go on contributing to more fraud and corruption. To deal with this and break the circle along with an ethical tone at the top of leadership to inspire employees to do the right thing, there also needs to be a means of effective reporting of malpractices as any chain is only as strong as its weakest link. Implementation of efficient whistleblower policies and procedures in organisations has been shown to be one of the best means to do this. Without doubt many malpractices and instances of fraud, crime and corruption only come to light because someone blows the whistle. 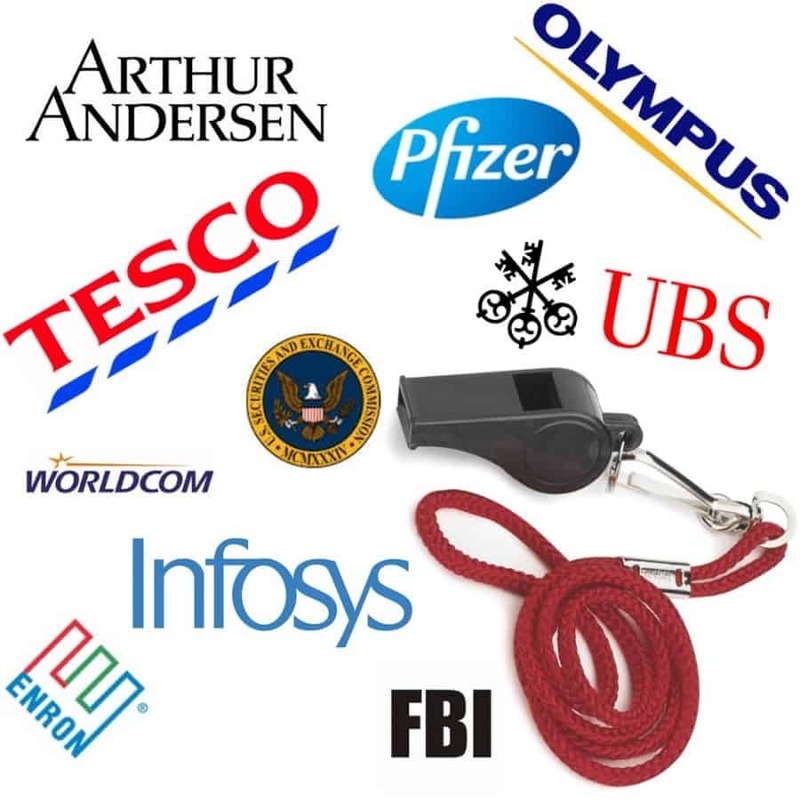 Unfortunately though, the value that organisations generally put on whistleblowing seems to be frequently overlooked and even inversely related to the enormity of the crime the whistleblower is exposing. All too often whistleblowers are dealt with in a negative way and find themselves bullied and becoming objects of victimisation. This raises the paradox of whistleblowing as a major method for uncovering wrongdoing: an effective method of increasing transparency and enhancing good governance and a way of uncovering corruption and malpractice is frequently a double-edged sword for whistleblowers as they risk abuse and potentially loss of position and income. Little wonder then that many observers of dubious practices in the workplace choose to remain silent. The National Business Ethics Survey 2013 indicated that in the USA one in three workers observing workplace misconduct chose not to report it. This was coupled with an estimated retaliation rate of over 21% towards workers who did report wrongdoing. In the UK legislation to protect whistleblowers has been largely ineffective whatever the good intentions of the lawmakers and in spite of the frequency of Government commissioned reports identifying the benefits of whistleblowing and praising whistleblowers for their courage in making a stand against malpractices. Whistleblowing generally now has a good public perception whereas perhaps 15 or even 10 years ago it may have been seen as a something sneaky like ‘telling tales’. Perhaps this is because during that period the world has witnessed some spectacular scandals and many of these only became apparent as a consequence of someone blowing the whistle. Few, unless they were actually trying to hide something, would condemn the acts of the whistleblowers who for example revealed the role their employing banks were playing in high level tax avoidance or rate rigging, or deny the bravery of those who have revealed serious and detrimental failings in many NHS trusts. (However it is arguable whether at a macro level, wikileaks or the acts of both Julian Assange and Edward Snowden in this field have advanced the cause of the Whistleblower as a force for universal good – we may have to wait for History to let us know the ultimate outcome on this). 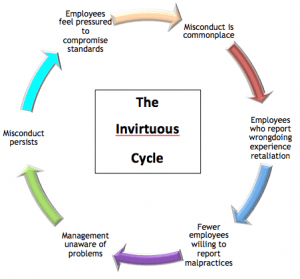 However at the micro level organisations themselves normally react in a very negative manner to whistleblowing, often bullying the employee, dismissing them and whilst a ‘fortunate few’ may be paid off when the organisation tries buy their silence with gagging orders, for many others there is an uphill struggle to get any justice at all for the retaliation and economic and personal loss they suffer. At this point perhaps it is relevant to distinguish between two levels of whistleblowing, namely internal whistleblowing and external whistleblowing. Most people who have a concern tend to raise this internally with their line manager or superior first and very few whistleblowers “go public” (that is blow the whistle outside the organisation) without passing through this preliminary stage. Internal whistleblowing thus provides an organisation with a golden opportunity to investigate the malpractice and ‘right the wrong’. This, facilitated by efficient whistleblower policies and procedures, has obvious advantages to both parties, for if the employee has voiced concern then rectifying the problem is usually the end solution. The benefits to both parties should be obvious as the problem, if it is resolved and contained, usually results in no long term damage done to reputation. However as too many whistleblowing cases show, the organisation response is often hostile, criticism of current practices is unwelcome and the “concerned employee” is now viewed at best as disloyal or at worst as an organisational pariah and hence deserves being victimised. Whether such intimidation is done with the intention to bully the employee into silence or as a planned catalyst to encourage them to leave is immaterial because either way it is often counter-productive. This is because faced with this situation many “internal whistleblowers” at this stage then turn into external whistleblowers. They make a public disclosure to regulating bodies, the press or government bodies and the problem is exposed in detail in the public domain. Erica Henik conducted an in depth study of actual external whistleblowers in 2008 (Mad as Hell or Scared Stiff? The effect of Value conflicts on Potential Whistle-blowers) and found that contrary to what one might expect, external whistleblowers made the decision to go public because of their initial concerns being ignored and IN SPITE of threats and retaliation. Seen from the whistleblower’s point of view she concluded that the decision to be an internal whistleblower is primarily motivated by emotions – usually annoyance and moderate anger – at wrongful activities, and this leads them to report it to management. If nothing is subsequently done by managers, she found that the outrage and frustration of being ignored or punished for bringing malpractices to management attention propels them towards reporting externally. Surely there are several lessons that organisations can take from this? First why allow something to be confrontational if there is an alternative? Avoiding dealing with malpractices can be construed as condoning the wrongdoing – so once the wrongdoing has been flagged up why not deal with it rather than risk it escalating to the extent of high profile negative publicity? A reputation lost can be costly in terms of bad PR and customers and potential employees not wanting to be associated with a company conducting itself on dubious lines without factoring in the obvious loss of profit – is this a sensible strategy for a business? Conversely most customers and employees want to be associated with companies that demonstrate high ethical standards, organisations that value their workforce, comply with the law of the country they are operating in and promote a healthy relationship at all levels of its hierarchy. Furthermore if there are malpractices going on in an organisation, those at the top especially those involved in governance if they have any ethical values should really welcome these matters being brought to their attention. 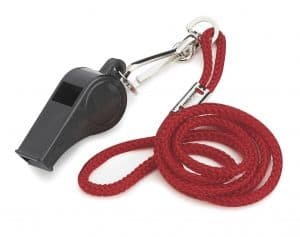 How can whistleblower policies and procedures be harnessed positively to the benefit of everyone so that corporate governance can be strengthened and without any detriment to the person blowing the whistle? Requirements for companies to set up anonymous hotlines under Sarbanes Oxley Legislation and the Dodd-Frank Act 2010 for reporting accounting and financial infringements in the USA have seen the widespread use of hotlines elsewhere and they are becoming one of the management tools to help instil and manage the company ethical stance and its code of conduct. Organisational hotlines generally can be a useful internal form of communication and potentially reduce the risk of external whistleblowing and increased exposure of malpractices in the public domain. Researchers Skivenes and Trygstad, (2010) suggest improved communications between the organisation and whistleblowers provides more opportunities to resolve issues in their work (When Whistle-blowing Works: the Norwegian Case) if there is an ‘extra’ stage in between a person reporting wrong doing to their line manager followed by reporting via a hotline. This is because it introduces a further means for the malpractice to be dealt with BEFORE a worker becomes so incensed that they feel the need to blow the whistle externally. A further advantage of having an anonymous whistleblowing hotline is that it may encourage the estimated third of workers who choose NOT to report wrongdoing to feel more comfortable about making a disclosure. Certainly the silence of many so called “Inactive Observers” (those who see a wrongdoing but remain quiet about it) is sometimes motivated because they assume that no action will be taken, however many may feel more comfortable anonymously divulging information that they may otherwise have withheld, and therefore anonymous whistleblowing hotlines potentially may result in more whistleblowing. In addition if an organisation does use its hotline effectively the “doubting Thomases” among the inactive observer group may be convinced that it may be worth using a whistleblowing hotline after all. 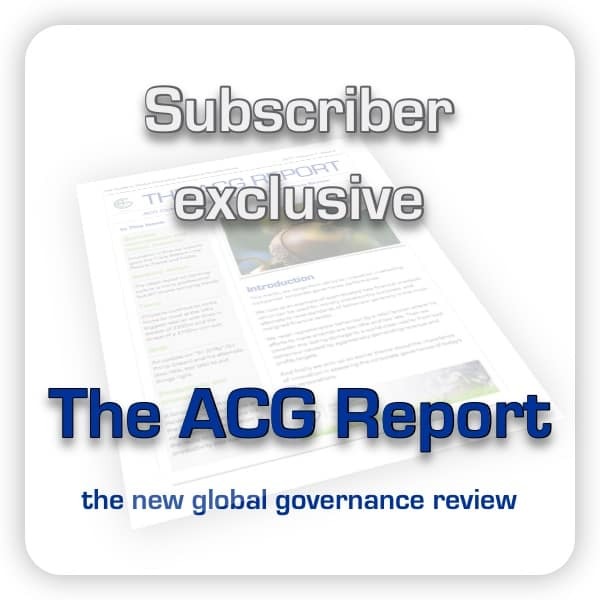 Clearly whistleblowing can strengthen corporate governance by bringing transparency to the fore. However we should not be in the position of relying on whistleblowing as a means of policing organisations – it is a useful tool, but it should be the last line of defence when all else has failed, rather than the first or principal one. Ethics as mentioned at the beginning starts at the top – leaders and those involved in corporate governance need to demonstrate a 24-7 commitment to integrity and thereby encouraging by example workers’ own commitment to ethical conduct. In matters of ethics leaders set the tone – their attitude is the “Alpha and Omega” for good corporate Governance. Gillian Moorse is a forensic accountant and former lecturer in accounting with a special interest in ethics & governance, specifically integrity in education & the workplace. She is now an external consultant for Oxford Brookes University.